Dycem has been manufacturing non-slip solutions since 1966. It all began in the 1960’s when David Cecil Mills, an innovative consultant engineer working in Bristol, discovered a special polymer with very high grip properties. 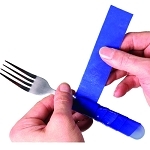 The original products were non-slip trays and coat hangers, which were sold in various niche retail outlets. The company’s original non-slip product line soon developed into a large range of products addressing numerous types of stabilization and gripping problems. Dycem was born, and is now a long established British manufacturing company with a strong reputation for quality and reliability. Dycem is internationally recognized under the ISO 9001:2008 standard and is proud to have attained the ISO 14001:2004 environmental management standards. Over the years Dycem has become the therapist’s choice for non-slip solutions. Arthritis Supplies is proud to offer non-slip and anti-slip products from Dycem Non Slip Solutions. 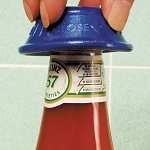 Helps those with a weak grip open bottles. 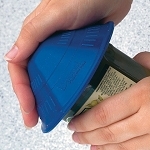 Helps hold plates, bowls or glasses securely in place.